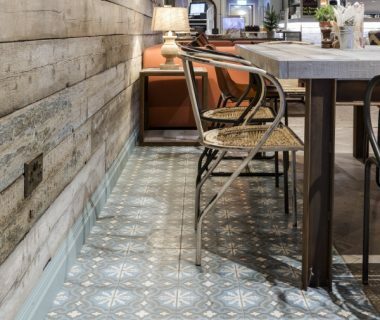 Many interiors trends, such as bold artworks, rustic wood-panelled walls and huge, low-hanging pendant lights, can be seen in modern coffee shops, bars and hotels, so they are a great place to go for flooring inspiration. And what you’ll find when you go looking will vary greatly from pattern or parquet, stone or ceramic. 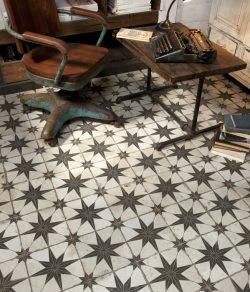 But here’s a quick run-down on what’s still hot in the world of flooring. 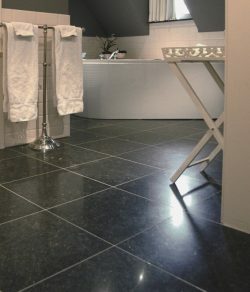 Is the continuing appreciation of grey floors simply a fad or a new addition to the repertoire of timeless styles? Judging by its popularity in the most stylish homes and magazines, it’s here to stay, and here’s why – there is a plethora of shades, from the dark and dramatic to the pale and interesting, but each and every shade offers sophistication to an interior space. Grey flooring in the form of cool tiles or wood-effect planks achieves a clean and classic look. One can modernise it with bold and bright accompanying colours, or keep it moody and dramatic by pairing it with darker shades. Scandi-style flooring such as blonde wood and wood-effect floor tiles, which is pale in tone and very versatile has also continued a huge flooring trend this year. It has the benefit of being soothing on the senses and is cool and calm, which is especially lovely in the summer. It can also add instant spaciousness and brightness to a room, especially when the sun illuminates the paleness. As a reflection of the fact that homeowners are becoming more creative and original with their décor, and not afraid to be a little daring in their choices, pattern is enjoying a resurgence of popularity again this year. Probably because it can give a room a sense of individuality and reflect the homeowner’s personality. And there is an abundance of different styles and designs and colours to choose from so you can really go to town with the pattern and bring an interior space alive. Pattern is ideal for crating any style from the modern to the classic – it is the fast track to a decorative element that doesn’t overwhelm. From modern lined form, zig-zags, Art Deco style and optically challenging floor tiles to the beautiful Moroccan-inspired floral creation; pattern has the tendency to create a statement. Parquet flooring was once the reserve of the grandest homes, but the chevron look is making a comeback – its geometric, angular flow means that it fits well in both a modern home or a timeless classical one. 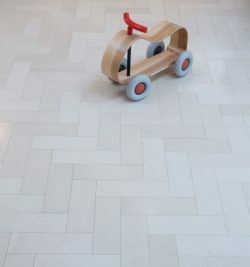 Parquet flooring and variations thereof now come in lots of different shapes, colours and sizes such as whitewashed oak parquet, a modern and characterful take on the traditional style, so homeowners have a world of choice at their feet. There is a definite move towards homeowners wanting to extend their space out into the garden with the popularity of outside sofas, patio heaters and outdoor standard lamps. And as part of that move, there is the increasing popularity of floor tiles that can join the inside and outside in one seamless flow. As the weather heats up, we’ll be seeing more people making the most of their garden and using it as extra dining space, to gather with friends or sit quietly with a cup of tea, admiring the view. 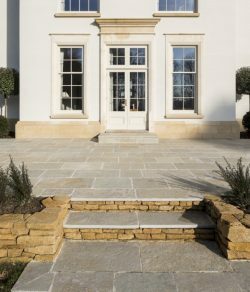 But with the great British weather being as it is, porcelain tiles are best and simplest option as they are impervious to water penetration so are an excellent choice for outdoor use.